I have scheduled this post to go out to you and by the time you read it I will be away. My "Film Crew" and I are having a beautiful cruise around the Mediteranean on a well earned break. We planned on going away this late in the year but we couldn't decide where it was we wanted to go. Several places came to mind ... Barcelona, Alicante, Malaga, Portugal and Majorca as we wanted to visit them all.... and on this cruise we can. We will be calling at every one of these ports and so I will have my camera on stand by for all the sight seeing we can do... and I will add photos to the Blog as I can. But I have not been lazy this month and lots of new things have been added to the website. One of the things that you may have noticed is the addition of a third column on the right hand side of each page. 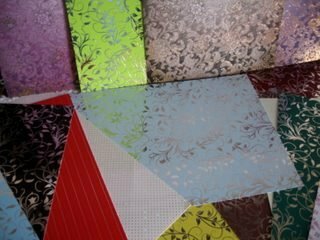 At the moment there are photographs in there but as I progress I will be adding links to other websites where I buy my cardmaking supplies from... as I get many emails asking me that very question. I will also be adding in links to other related pages within this website so that you will be going in the right direction for whatever it is you are wanting to do. Another new feature is the addition of the Pinterest Button on each page where a card photo has been submitted by you the visitors to the website. This means that you will have the opportunity to Pin other peoples work to the boards and show the world that you like what this person has done. It is an ideal opportunity for you to showcase your own work and comment on the other submissions that you will see. So I hope you will consider adding your photos to the Gallery Page Several new videos have also been added and that makes over 115 in total for you to watch. And I have continued to add more to the Spellbinder Series for all the Dpellbinder fans out there. One of the latest videos was in answer to the questions I get concerning which card I use to make my designs. Hunkydory and they are a company based in the UK. They have many types of card for you to choose and they also have an online service. Crafters Companion is another UK company and they are the ones for Centura Pearl card ... as well as lots of crafting goodies. Last month I add a page on how to make some very pretty Christmas decorations. 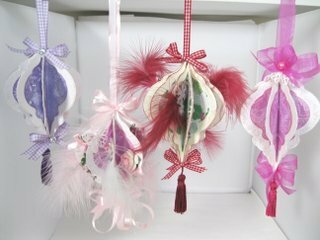 This time I have used the die 2011 to make a very pretty decoration that can be hung from the tree if you wish. Spellbinders Heirloom Ornament will show you how to get this look for yourself if you have this die languishing in your collection. Maybe this could be a different way that you have used it in the past. This is another project that has been added and this could be used for any occasion. 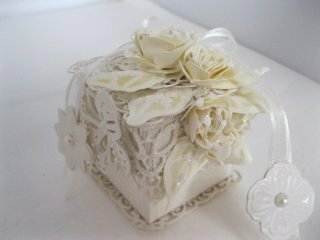 It is big enough to hold a small jewelery box for that extra special gift and in the video I have made it into a very lovely baby box that could bu used for Christening os even baby showers. Just get the old imagination going and you will be able to achieve whatever you want. The views for my videos on Youtube are going steadily upwards... and the toatl is now One and a quarter million. It is wondereful to know that they are well liked and have been found useful by so many who take the time to leave me some lovely comments. The link below will take you to a new window for the Blog pages... and pop back regularly as I will try to add photos of my holiday and the paces that we visit. Now once again it is time for me to say Thank You to everyone for the pleasure you give to me and please keep all your emails coming... I love reading them and I will always respond. But one thing I need to say is that if you don't add your email properly then I won't be able too do that ... so if you have not had a response then maybe I have been unable to send a reply back to you. Please keep visiting the website, Facebook and the Blog in the future. And finally a little word to "Anonymous" ... I am sorry but I will not be accepting photos, stories or comments that you leave for others if you do not sign your name. So if you do not see your comment there then it will be because I do not have your name and that is very impolite if you are giving someone a comment on their work.